Ann Jobson was widowed after two years of marriage. She lived with her sisters at Crawford Lodge, named after their mother and, with her sisters, supported many charitable causes. Ann Jobson was a widow of independent means who used her wealth to support many charitable ventures. In 1861 she took the unusual step for a woman of attending a public meeting of the Liff and Benvie Parochial Board in order to vote in favour of altering the means of assessment of the poor. Ann Jobson married Robert Jobson Jnr. of Longforgan in 1835 and, sadly, was widowed two years later. She was evidently a keen gardener. After the death of William Gardiner, the Dundee botanist, she subscribed to the fund set up for his son and in later years the Crawford Lodge gardener successfully competed in Dundee Flower Show. Ann Jobson and her sisters subscribed to many charitable causes. 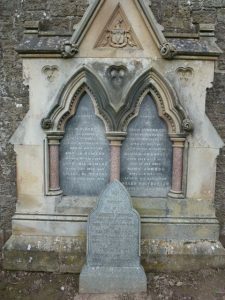 After her death she left legacies to Dundee Royal Infirmary, Dundee Female Society, Indigent Sick Society, Mission Work of St Paul’s Free Church Dundee, The Foreign Missions of the Free Church of Scotland, Free Church of Scotland Jewish Missions, Dundee Clothing Society and the Gaelic School Society. Anne was also known as Ann. The information above about Anne None Jobson has been collated from a range of digital and hard copy sources. To the best of our knowledge it is correct but if you are relying on any information from our website for the purpose of your own research we would advise you to follow up the sources to your own satisfaction. If you are aware of an inaccuracy in our text please do not hesitate to notify us through our Contact page.